WARNING: Do not operate heavy machinery or navigate the Slipstream while under the influence of this beverage. 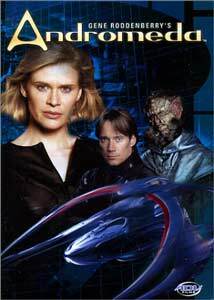 Volume Four of Andromeda offers up another batch of entertaining-yet-undemanding episodes. This time around, we get some welcome character pieces (Fear and Loathing in the Milky Way could be titled "Trance: What's Her Deal? "), and there are a few surprise developments in that regard, but episode for episode, plot point for plot point, this is all material that will be familiar to longtime sci-fi fans. As I said last time around, that isn't necessarily a bad thing. I still think that the series could do more to work the premise of a man out of time trying to reconstruct and rebuild a stable civilization, but with that hair, I guess no one would take Dylan Hunt (Kevin Sorbo) seriously, so we're forced to accept an hour of goofy plotting, mostly bland dialogue, and big explosions (whether they are warranted or not). At least the cast of characters is entertaining. I've grown quite attached to Harper (Gordon Michael Woolvett), Trance (Laura Bertram), and Andromeda (Lexa Doig), and I find Sorbo surprisingly likeable, even if he can't really emote. I could do without the stoic Tyr (Keith Cobb), except when he is making acerbic remarks, and Rev Bem (Brent Stait) is given to heavy pontification all too often, but four out of six isn't bad. This two-disc set includes episodes 15-18 of Season One. Beka: Where'd you get all the candles? Tyr: I rendered them from the fat of my enemies. Dylan is on trial again, and I marvel at how quickly this series recycles not only sci-fi clich�s, but itself. It starts with Dylan being kidnapped from the Andromeda and taken to the planet Mobius. There, he is assumed guilty upon capture, and tortured and beaten, though he has no idea why. Through flashback, it is revealed that Dylan took part in a Commonwealth mission to remove a Mobian dictator from power; when the mission went south, he ended up killing the man, and now he is being judged for the crimes. There are some nice ideas here, and a decent moral dilemma, but the clunky structure and an unwelcome reappearance in flashback of Dylan's former first officer (Steve Bacic) muck things up a bit. Here is a totally original episodes, except for the parts that aren't, which is all of them. Still, I was entertained. The Andromeda is contacted by an entity made up of many smaller computerized bits that calls itself "The Consensus of Parts." Individually, they are scrap, but together, they form an intelligent entity (coughborgcough). After a visit from a CoP emissary calling itself HG (Matt Smith), Dylan decides to try to get the entity to join the Commonwealth. As they travel to that region of space, HG, having been away from the collective too long, begins to develop his own personality (is it a coincidence that adding a few letters to HG will net you "Hugh"? ), which doesn't exactly make the CoP happy. The shows manages to pack in a whole bunch more plot, including a mean emissary called VX and an attempt to "assimilate" Andromeda, and you can almost imagined the Xeroxed script pages. But the episode is well-plotted and it moves quickly, and that means it is above-average Andromeda. It seems when it comes to inventing alien species, resistance to ripping off old ideas is futile. Still, 3.5 Andromedas. In this mostly plotless but entirely entertaining installment, Harper and Trance, off on a mission, happen to run into the villainous Gerentex (John Tench) who we last saw in the pilot. Gerentex, the most ineffectual baddie since the last Bond movie, takes them prisoner and forces them to help him track down an old diary that will provide the directions to a planet of untold wealth. The subplot with Dylan and Beka trying to broker a deal with a potential Commonwealth member planet is pointless, but the humorous trio of Gerentex, Harper, and Trance (who reveals herself to be more than the airhead she seems) provides more than enough entertainment to fill 42 minutes. If you were wondering about the title, the characters visit a Vegas-like planet looking for information. See? The series can be clever. Sort of. Yes, but Trace... why ARE you purple? 4 Andromedas. Here's an episode that focuses on Rev Bem, a character that bores me to no end, which is probably why I found this to be the least compelling installment in this batch of episodes. Rev Bem gets a call from a fellow Wayist who is living on the colony planet Serendipity. It seems that the Hijra, brutal slave traders, have designs on the peaceful population. Andromeda flies to the rescue, but the crew is faced with a moral dilemma when it is discovered that the colonists have a "genetic memory," and if Dylan teaches them to defend themselves, it may alter their evolution and turn them into a violent race. The memory conceit is a little hard to swallow, but the idea is compelling enough. Where this episode falters is the pacing and, particularly, the acting from the guest cast, who make the appealing-but-certainly-not-outstanding crew of Andromeda look all the more impressive. Image Transfer Review: Andromeda airs in 4:3, but was shot with high-definition cameras; thus, we can enjoy the show on DVD in 1.78:1 anamorphic widescreen. Colors are nicely saturated, and though the rich hues are a bit cartoonish, they match the intended look for the series. Blacks are nice and deep, and shadow detail is very good. The special effects scenes show some shimmer, likely because they were mastered at a low resolution. Aside from that small problem, though, this series looks great. Audio Transfer Review: The included DD 2.0 mix isn't bad, and presents dialogue well, anchoring it in the center channel with only a bit of bleeding into the mains. The wide front soundstage features some nice directionality during space battles and fight scenes, but nothing too impressive. Surrounds stay mute throughout, not even offering enhancement for the score. Extras Review: Note that while the back of the box advertises a commentary for the fan-favorite episode Fear and Loathing in the Milky Way, it is not included on the disc. The latest in a series of text profiles is the Profile of Rev Bem�a few text screens of character backstory, along with a brief interview with actor Brent Stait and some costume design sketches. There is another text bio on disc two, this one for executive producer Jay Firestone (how many executive producers does this show have?). There is an extensive text section that provides information about the governmental organization of the Systems Commonwealth, and another glossary that includes pseudo-scientific terms created for the show (P-R, we're almost through the alphabet!). Disc two's text extra is entitled Timeline of the Commonwealth: Conflict and Renewal. Both discs include deleted and alternate takes, three minutes from Forced Perspective and one from The Devil Takes the Hindmost. Both also include image galleries�the first, "Cast Shots"; the second, "Prop and Set Concept Drawings." This volume's featurette is Alien Make-up, a short piece that outlines the arduous task of outfitting Rev Bem with his otherworldly prosthetics. Nice, but it runs for less than three minutes. Another blooper reel is a welcome inclusion, but I am getting sick of the nearly minute-long intro on each of these gag reels. You have to sit through the same old stuff each time to get to what amounts to maybe a minute of new material. Disc one has promos for the first two episodes, while disc two has promos for the others. ADV previews are also split between the discs; all told, there are clips for Farscape: Season 2, Noir, Zone of the Enders: Idola, Gasaraki, Excel Saga, The Devil Lady, and Super Atragon. The grade would be higher had the advertised commentary been included (I hope the dropping of the tracks doesn't become a trend, as disc five also purports to have a track that isn't there), but this is still a nice bath of extras for an episodic TV release. Andromeda has finally won me over. No, I don't love the tired plots. Yes, I do love the characters. I'm not exactly invested in the show, but even the poor installments are surprisingly entertaining. Its billing as TV's top "action hour" is entirely fitting; don't go in looking for more, and you'll find something you'll quite like.